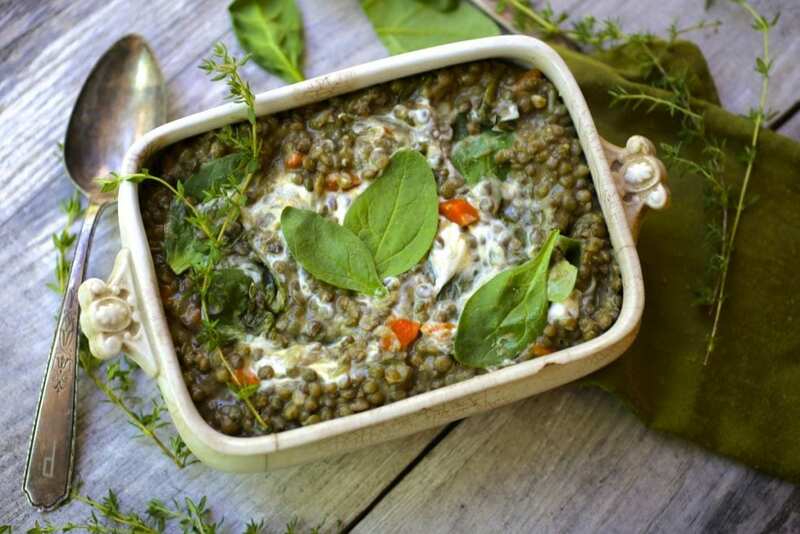 We love this Puy lentils with spinach dish, a balanced recipe full of healthy pulses and colorful spinach greens. It’s an ideal side to a meat dish but can be enjoyed as a filling lunch. I’ve never been what you would call a lentil “fan”. I mean, they’re fine and everything as far as legumes/pulses go but I certainly don’t wake up thinking about a lentil dish I absolutely can’t wait to make. Until now. There are a few … I don’t even want to say ‘tricks’ because it’s not like there’s any fanciness or magic going on here. It’s just that there are a couple of ingredients that elevate this humble dish and turn it truly delicious. In fact, it’s so simple that I’m afraid you’re going to roll your eyes and wonder if I’ve finally gone off my rocker. It’s not the huge bunch of baby spinach that gets stirred in or the swirl of Crème fraîche that it’s topped with. It’s olive oil and vinegar. That’s it. The trick, if there is one, is to use more of both, at the very end, than seems appropriate. These lentils need to be dressed like a salad. They need the smooth grassiness of good olive oil and the sharp tang of red wine vinegar. Start with a tablespoon or two of each and keep adding and tasting until it’s just right; earthy, piquant and delicious. Of course, you could serve it like we did, with Crispy Spiced Duck Legs and Roasted Peaches with Honey and Thyme, but I enjoyed them just as much on their own the next day. 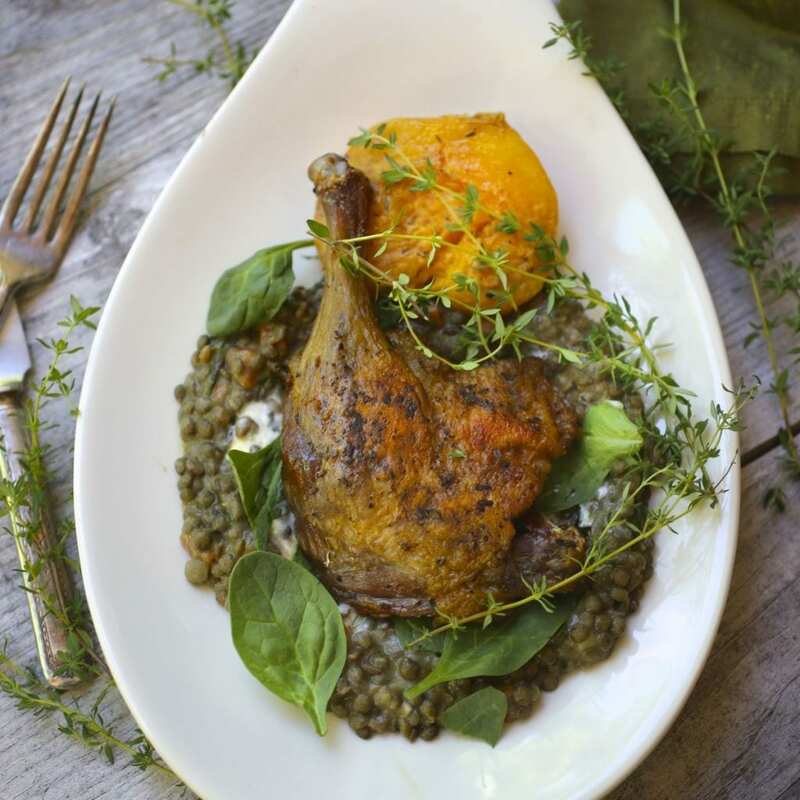 This puy lentils and spinach recipe (and the idea of serving it with duck legs) was inspired by this recipe by Jamie Oliver. 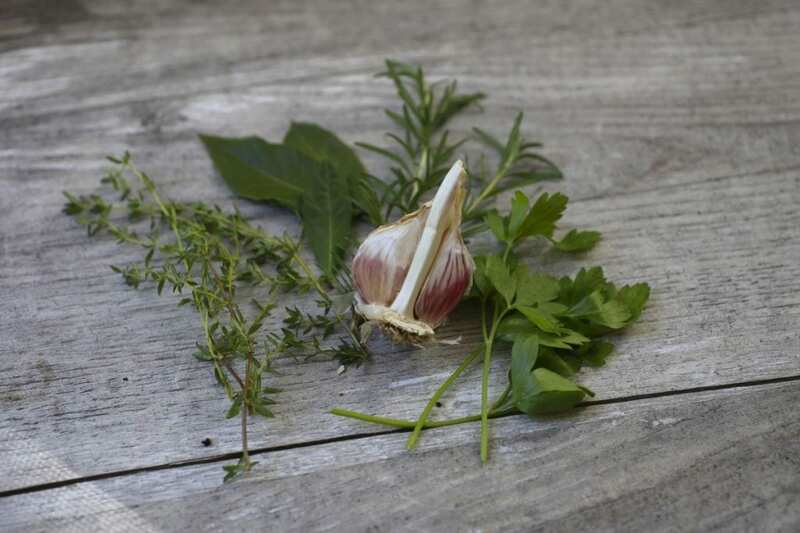 A bouquet garni (herbs tied together) along with garlic add great flavor. 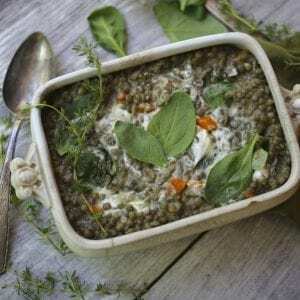 If you’re making puy lentils with spinach for a dinner party, you could make it an hour or two ahead of time, but wait to add the spinach until just before you want to serve it. You want it bright green and fresh. Obviously leave out the Crème fraîche for a vegan version. If you have leftovers, you could add some extra stock for a delicious lentil soup. In a dutch oven (or large heavy-bottomed pot) heat 2 tablespoons of olive oil or duck fat until shimmering. Add the carrots and onions and cook until the vegetables begin to soften but not brown (about 10-12 min). Add the garlic and cook for 1-2 minutes more, until the garlic is fragrant. Once the vegetables are soft, add the lentils, stock, potatoes and the bouquet garni. Cook uncovered for 45 minutes, stirring occasionally. When ready, the lentils should be soft and most of the liquid should be absorbed. If the liquid is absorbed before the lentils are tender, add more stock (or water) ¼ cup at a time until they’re ready. When the lentils are finished, remove the bouquet garni. If the spinach leaves are larger, roughly chop them (or just add them is small) and stir into the lentils a bit at a time until they are all wilted. Cook for 4-5 minutes more. Season the lentils well with salt and pepper, a good glug of olive oil (3-4 tablespoons) and 3-4 tablespoons of red wine vinegar. Stir everything one last time and check the flavors again. The lentils should have a little vinegary tang to them but not be sour. To serve, spoon the lentils onto plates and swirl in a spoonful of sour cream or Crème fraîche (if using). this was seriously yum, and only improved as it sat in the fridge. wouldn’t change a thing. i made it with some duck breast and it was absolutely perfect. it’s a good back drop for sweet/savory dishes (pairs really well with chinese five spice) and completely satisfactory on its own as a no fuss lunch. one thing to note that the recipe doesn’t specify – “cook uncovered for 45 minutes” means low heat, barely simmering. also, be prepared to have A LOT of lentils on your hands. luckily they take well to freezing.